The North West Cambridge Development (NWCD) is the University of Cambridge’s largest capital project in its 800-year history. AECOM was asked to create a benchmark for innovative and active 21st century living that was in line with the high aspirations of the world-renowned institution that is The University of Cambridge. AECOM embarked on creating proposals for a new neighbourhood that will transform a 150 hectare and previously designated greenbelt site into a new long-term and sustainable mixed-use urban and academic community. The site is highly sensitive and in a city with extremely high standards and history. AECOM ensured that the project was developed hand in hand with the community. Innovations include the UK’s largest non-potable surface-water recycling network, which is integrated with enhanced ecological habitats, open spaces and cycling and walking routes. The University of Cambridge asked AECOM to create a new extension to the City, one that was ambitious, long-lasting and offers a high quality of lifestyle for both the academic and non-academic communities alike. The importance that landscape planning and design brought to the team was recognised early on by the University. Entrenched within the masterplanning team, our landscape architects were there from the beginning crafting and helping define principles, preparing clear design guidance and development codes, and supporting the submission of planning applications for the North West Cambridge Development (NWCD). The University of Cambridge was driven to push the sustainability boundaries on a development this size, aiming to achieve BREEAM Excellent and Code for Sustainable Homes Level 5 for which the landscape would make a considerable contribution. 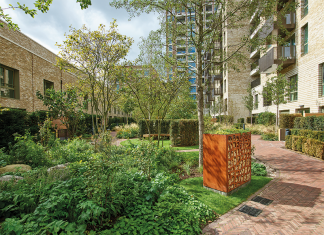 The aim was to create an exciting, locally distinctive, and sustainable neighbourhood that meets the aspirations of the University, as well as setting a benchmark for local landscape planning. As the landscape infrastructure played a critical role, there was a considerable amount of time spent researching best practice across the globe that could help substantiate our innovative solutions. 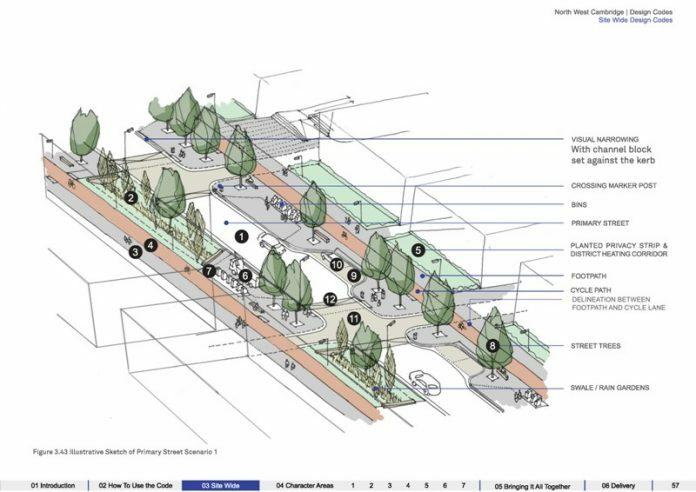 The landscape team participated in multiple events with both stakeholders and the community to ensure that their feedback and ideas were incorporated early into the design process so that in the end these it felt like a collaborative effort. The clarity of the process and development of a shared vision, together with the documentation and presentations that were put together to discuss and communicate ideas, made this complex journey a lot smoother as all parties felt included. The end result was positive and very productive. As the largest capital project by the University of Cambridge in its history, this development aims to be recognised nationally and internationally as a leading sustainable development, including the UK’s largest non-potable surface water recycling network. The research, communication and collaborative design process necessary to convince all parts that the landscape could play such a significant role was a tremendous task. Engagement with the local community and stakeholders was a central requirement from the outset. The team ensured that the needs of the University were met, but also enabled the team to respond to local concerns. Many of these concerns were then integrated into the plans, including working to overcome potential flooding; protecting the sites landscape and characteristics, such as retaining mature trees and landscape features; ensuring that the development is permeable; promoting cycle and pedestrian networks; and providing local amenity, sports and recreation spaces. The AECOM design codes seamlessly integrated the non-potable surface water recycling network; infrastructure required for the development; enhancement of existing ecological habitats; a system of legible and accessible public open spaces with priority for cyclists and pedestrians; exciting play and sport destinations; protecting existing trees and hedgerows; an innovative waste management strategy; easy to maintain; but above of all a great place for people to live.